Live the American dream and take in some of the country’s most beautiful sights without spending a fortune. Devised by travel genius and blogger Derek Low, this train tour covers 3,400 miles of the great country from San Francisco to New York. The scenic cross-country trip hits hotspots like Salt Lake City, Denver and Chicago along the way – but the best part about is it’ll cost you just $213 (£172.30). And you don’t even need to book weeks off work because Derek revealed he packed the coast-to-coast train ride into just four days by doing it without stopovers. Revealing his top money-saving secrets on his blog, Derek said you can buy a ticket for the direct California Zephyr and Lake Shore Limited routes for a fraction more than $200. Although he decided to push the boat out a little bit further and opted for the 15-day rail pass, costing $429 (£347.02). To make the most of the jaw-dropping scenery, you can sit in the "Sightseer Lounge car" like Derek did. The cabin features floor-to-ceiling windows and diner-style tables and chairs. On top of that, helpful historians and park rangers will talk tourists through the areas they’re passing through. Derek’s insider knowledge has become so in-demand he’s now started offering a travel planning service, where he’ll help you plan your own train trip, costing just $49 (£39.64). You can see the full journey on his website. 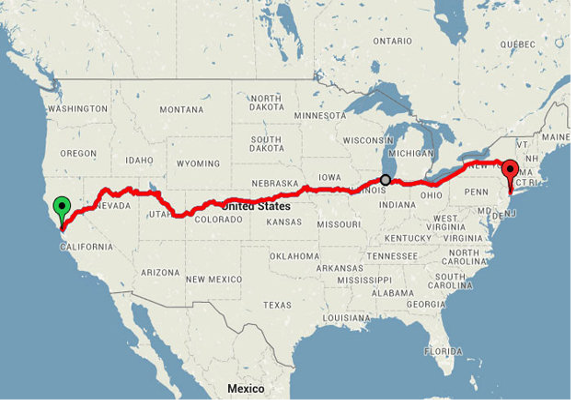 But if train travel isn’t your thing, why not soak up the States by car? Road trips are a fantastic way to see more of a country or continent. All you need is a vehicle, a companion (or you can go it alone), a great playlist and you're good to go. Possibly the most famous drive in the world, Route 66 begins in Chicago and ends in L.A, showcasing America over 2,448 miles, eight states and three time zones. It will take you through Illinois, Missouri, Kansas, Oklahoma, Texas, New Mexico, Arizona and California. Be sure to stop at the retro petrol stations and old school diners along the way.